Maibowle, built in Germany, invented in Britain? In May last year, an East German publican introduced me to a summer punch, a drink previously widely known but now rarely served at least in its fresh, homemade variety. The main ingredient of Maibowle, or May punch, is a forest plant called Waldmeister, Master of the Woods in English but more commonly known as woodruff. Once the plant has been procured the punch is easy to make: two parts white wine to one part sparkling dry white wine, which is then infused with a bunch of Waldmeister flowers for thirty minutes or so – don’t include the stalks, though, as they will leave a bitter taste. Sugar is added if desired, and strawberries as a garnish. The taste is herbal, with hints of cinnamon, and is supposed to have medicinal properties (a claim made for most alcoholic drinks, it would seem). Speaking from personal experience, it certainly has the desired effect. But is it really a punch? Well, the word ‘punch’ comes from the Hindi ‘panc’, meaning five, referring to the number of ingredients: alcohol, sugar, lemon or lime juice, spices (or tea), and water, a way of mixing drinks that the British discovered in India and immediately adopted as their own. 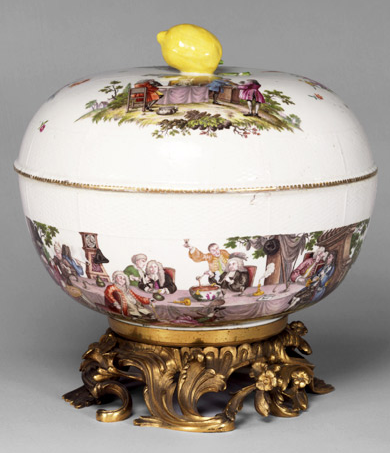 Europe was quick to follow, and by the eighteenth century a punch bowl was a popular addition to the china cabinet in both Britain and Germany [see the Meissen punchbowl in the picture above]. You might argue that Waldmeister in its simplest form has only two ingredients – Waldmeister and wine – but many recipes suggest lemon juice, too, or soda water instead of the sparkling wine; throw in a bit of sugar and it’s a punch, in the strict definition. When you then also learn that the word ‘Bowle’, which in German simply means punch, is borrowed from the English word ‘bowl’, I think there is enough evidence to suggest that the British have been a key influence in building something uniquely German. This entry was posted in Uncategorized by martynfarmer. Bookmark the permalink.